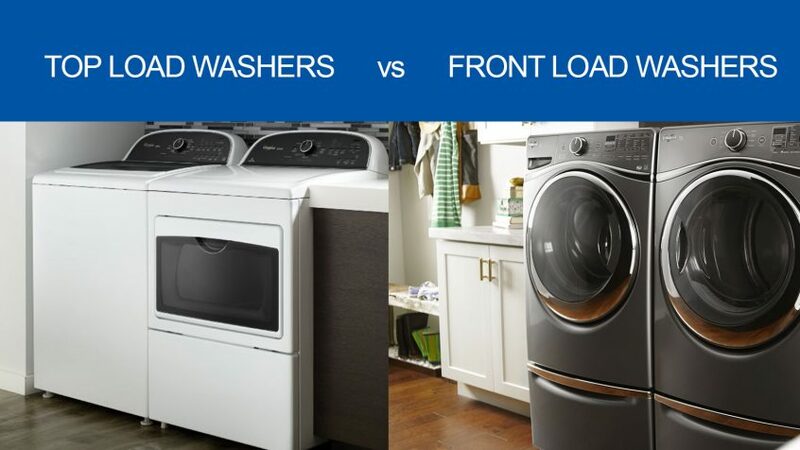 Front Load Washers vs Top Load Washers – Which Type is Best for You? Appliances such as washers and dryers are a substantial investment for most people these days. Couples with children use their washer and dryer almost on a daily basis. Even singles typically do a few loads of laundry every week, so it is important to do a little research before committing yourself to a specific washer to ensure you will be happy with your investment. Many people find the benefits of a front load washer vs a top load washer have more to do with the stage of life they are currently experiencing rather than the actual appliance itself. Below we will discuss different benefits and drop backs of each type. For seniors or those who suffer from periodic or chronic back problems, bending down to put clothes in a front loading washer is challenging and taking wet clothes out of a front loading washer is more challenging yet. So for those who struggle with bending and stooping, a top loading washer probably makes more sense. Generally speaking, front loading washers tend to edge out top loaders when it comes to cleaning performance. For families with children who are very young or who have children heavily involved in sporting activities, a front loading washer is probably a better option. Knowing your washer can handle all the dirt and tough stains that children seem to have a knack for getting on their clothes can save quite a bit of money in clothing expenditures for the average family. On the other hand, seniors and possibly singles, most likely don’t heavily soil their clothes that often and don’t need the heavy-duty cleaning power of a front loading washer. Front loading washers are also known to handle larger loads such as blankets or comforters than top loading washers. Some people don’t mind making an occasional trip to a laundromat to clean larger items, but others want their own machine to handle very large loads. Front loaders also use less water than top loading machines and for families who do a lot of laundry, a reduced water bill has a great appeal. On the downside, some people might find it irritating when they cannot quickly add a forgotten sock or other dirty piece of clothing to a front loading washer since they self-lock for most of the washing cycle. Samsung does have a new design that allows extra garments to be added. Some people are finding a good compromise with high-efficiency top loading washers. They do not have an agitator which takes up space, therefore large items such as blankets and comforters can fit more easily. Another benefit to going agitator-free is a reduction in wear and tear on clothing. In addition, their ability to clean clothes rates as high as front loading machines and since they are energy-efficient, they use less water which translates into increased savings. Lastly, before making any washer or dryer purchase, it won’t matter which type you really want if you cannot make them fit into the space you have allotted for them. Some people have laundry rooms designed to fit the largest washer and dryer available on the market. For many others though, space is at a premium. Always make sure you have complete measurements of the area where you are planning to put your appliances. Make sure there is enough clearance room for water hoses, the electrical plug and enough room to open the door completely if you are planning on buying a front loading washer. Some may have to resort to stackable units, but even those can be challenging to fit in closet-type spaces so be sure any appliances you buy will definitely fit. Also make sure your doorways are wide enough for appliance deliverers to bring in your new washer. Most front load designs can be configured to stack. Refer to the installation instructions for your product to determine if that’s possible. A front load washer will clean large bulky items better than top load washers due to gravity. A front load washer tumbles like a dryer and allows the proper turnover to get items cleaned. A top load design has to work against gravity to get the same turnover effect. What people don’t realize is that the first washer designs were actually front load. Top loads is an American design that became popular in the 1950’s and 1960’s due to a cheaper manufacturing cost. Even though we prefer front load washer designs, a top load washer will still clean your clothes when loaded correctly. For questions on how to properly use your washer, please contact us.